Piñon has long been known as “Where the Pavement Ends and the Wild West Begins,” but if you’re entering from the west, you could just as easily think of it as where the pavement begins. 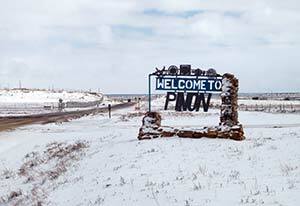 For as long as anyone can remember, Piñon's unofficial slogan has been, "Where the pavement ends and the Wild West begins." It makes the chapter officials cringe. "We're trying to get away from that," said chapter Vice President Evelyn Meadows, wrinkling her nose. "It's so negative." "It didn't start out as anything bad," insisted Secretary-Treasurer Ramona Nalwood. "It was because of the rodeo." The grounds for Piñon's famous rodeo, explained Nalwood, were at the end of the paved road -- hence the "Wild West" metaphor. Navajo Route 4 still ends in Piñon, but at least, since a year and a half ago, it is paved all the way to U.S. Highway 191. As long as you are heading east from Piñon, you can drive on pavement all the way to Chinle and Ganado, and New York City, for that matter. "We're very, very pleased it's done," said Meadows, recalling that it was about 10 years in progress. "We had a big appreciation dinner for the road crew." Perhaps the best way to get rid of the pesky slogan will be to make it no longer true. Name: It may be a misnomer. "There really aren't a lot of piñon trees here, unless you go up in the canyons," said the chapter's secretary-treasurer, Ramona Nalwood. The chapter is starting to use its Navajo name more, "Be'ak'id Baa Ahoodzani" ("Body of Water in a Sunken Area") after an artesian well in the area. Land area: 107,250 acres. Piñon lost some of its land in the Navajo-Hopi land dispute. Famous sons: The "Wild West" has produced some of the best Navajo cowboys, including the late Willie Jodie. Navajo Code Talker Willie Kescoli Begay was from here. History: The area might have been settled by people from Chinle who migrated to the mountains for winter pasture, according to Harrison Lapahie on www.lapahie.com. When U.S. Army Capt. John Walker traversed this area in 1858 with two companies of mounted riflemen, he reported only the eastern side was populated. According to Lapahie, the Spanish may have come through much earlier. Ramon Hubbell and Evon Vogt, acting on a tip from local Navajos, looked for their inscription in a rock in 1939. They found the rock face described by the Navajos, but if the inscription was there, a slab of rock had fallen over it. Piñon was heavily impacted by the settlement of the Navajo-Hopi land dispute, experiencing an influx of refugees from the Hopi Partitioned Land. The Navajo Division of Transportation was on the verge of continuing the pavement west all the way to Hard Rock, which would have made it the quickest route to Hopi and Flagstaff from Chinle, when the NDOT dissolved the Chinle Agency Roads Committee, Meadows explained. The committee was charged with prioritizing roads in Chinle Agency, and had listed N4 for construction in 2015. In preparation, Piñon and the other affected chapters had negotiated with the Hopis, who lay claim to a three-mile stretch of the road, and achieved an agreement to go ahead with the project. Now, said Meadows, it seems to be off the books. "Now they're talking about just gravelling it up to the wash," she sighed. The Navajo Nation Council's Resources and Development Committee is also toying with the idea of rerouting the road so it would be exclusively Navajo, which leaves Piñon shaking its collective head. "We want the original route, where the road runs now," said Meadows. "Why go north and have to redo the whole roadbed, starting from scratch? Why did we even sit down with the Hopis if they were just going to do that?" The chapter is also negotiating with the Hopis on paving the road from Low Mountain to Arizona Highway 264, which would give Piñonites easy access to the Hopi reservation and south to Winslow. Meadows said the Hopis may be willing to allow the paving if the Navajo Nation offers to maintain the road. "Right now the Hopi road engineer retired and they have no one qualified to operate the grader," Meadows explained. It's this kind of negotiation process Piñon is becoming famous for. Frustrated by its lawless, "Wild West" reputation (although Meadows says she's not convinced Piñon is any worse than any of the isolated rural chapters), the chapter last year launched the "Take Back Our Community" campaign in partnership with the Indian Health Service, Navajo Nation Behavioral Health, Child Protective Services, the Navajo Housing Authority and other community stakeholders. Rather than rail at the Chinle Police District for being slow to respond to crime reports, the committee met with acting Capt. Dempsey Harvey to get his side of the story. According to Meadows, Harvey revealed a shocking state of underfunding -- he had no money to pay his handful of officers for overtime, and at least one policeman only had one uniform. "He said the best thing we could do to reduce crime is advocate for his department," said Meadows, "so that's what we did." The district did get a little more funding, and to up morale, the chapter hosted an appreciation dinner for them too. There are still posters on the walls of the chapter house thanking the police for their protection. If it sounds like this chapter is being run by a bunch of wise másánis, that's exactly right. Long-time community activist Bessie Allen, who helped attract both the public school and the health center, built in 2005, is the president.